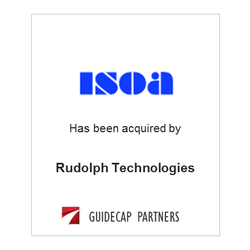 ISOA, a developer of semiconductor defect detection and classification systems, has been acquired by a Rudolph Technologies. The acquisition is a significant addition to Rudolph’s product portfolio and their continued goal of bringing leading-edge metrology solutions to the global marketplace. ​GuideCap served as the financial advisor and assisted in negotiations for ISOA.